Nature\'s blessing hair pomade is a conditioner, restorer and root builder for hair. It is the ultimate treatment method for broken hair. 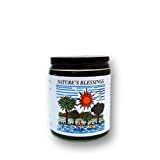 Previous: Nature’s Blessings Hair Pomade 4 oz.